RTIME is a solution that delivers unmatched planning and analysis tools, traceability and auto-generated traceability matrices, visual requirements with our exclusive mind map integration, and excellent ease of use through MS office tools integration. What Strategic Planning solution do you use? The Workboard Enterprise Results Management solution helps organizations align OKRs, automate business reviews and execute for growth. ClearPoint Strategy is a software-as-a-service balanced scorecard design, management, and reporting tool. 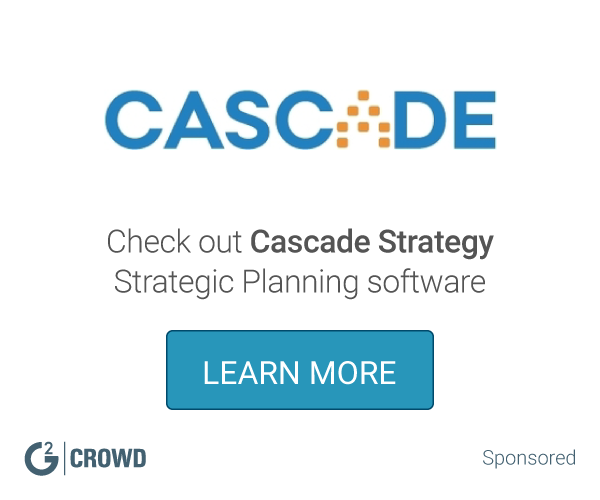 Cascade is a complete software solution that makes it easy to turn your strategy into reality. Helping you to create your plan, engage your people and track results. Envisio makes it easy to deliver your plans, align staff with your strategy, measure performance and report progress. Khorus is the first solution designed specifically to help CEOs deliver predictable performance, all in one easy-to-use system. RESULTS.com is a business execution software company that helps small business businesses transform and execute their strategy. AchieveIt enables businesses to easily track and monitor their most important initiatives, drive change, and achieve more. AchieveIt provides leaders real-time visibility into the status of critical initiatives, creates alignment between strategy and projects, provides accountability for results, and enables efficient collaboration. AgileCraft is a strategic planning software available for scaling agile to the enterprise. KPI Fire is a powerful software system that aligns your people and projects to your metrics and strategic goals. It makes your strategy visual and clear which enables execution and better results. Cloud-based software designed to help you execute your quarterly and long-term strategic plans. * We monitor all RTIME reviews to prevent fraudulent reviews and keep review quality high. We do not post reviews by company employees or direct competitors. Validated reviews require the user to submit a screenshot of the product containing their user ID, in order to verify a user is an actual user of the product. Hi there! Are you looking to implement a solution like RTIME?